Sometime during the week I realized that our departure date corresponds with the date of the fiscal cliff, coincidence? Our preparations continue and I feel nearly ready to leave, maybe too ready since I keep buying stuff that even I’m not sure I really need. 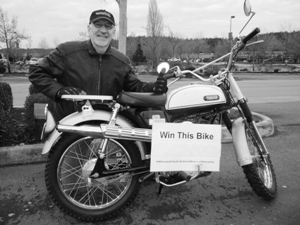 This weekend was the Seattle International Motorcycle Show, Deby and I went on Sunday since Saturday was a full day preparing to host the Northwest Norton Owners Holiday Party (another whole story but lots-o-fun). 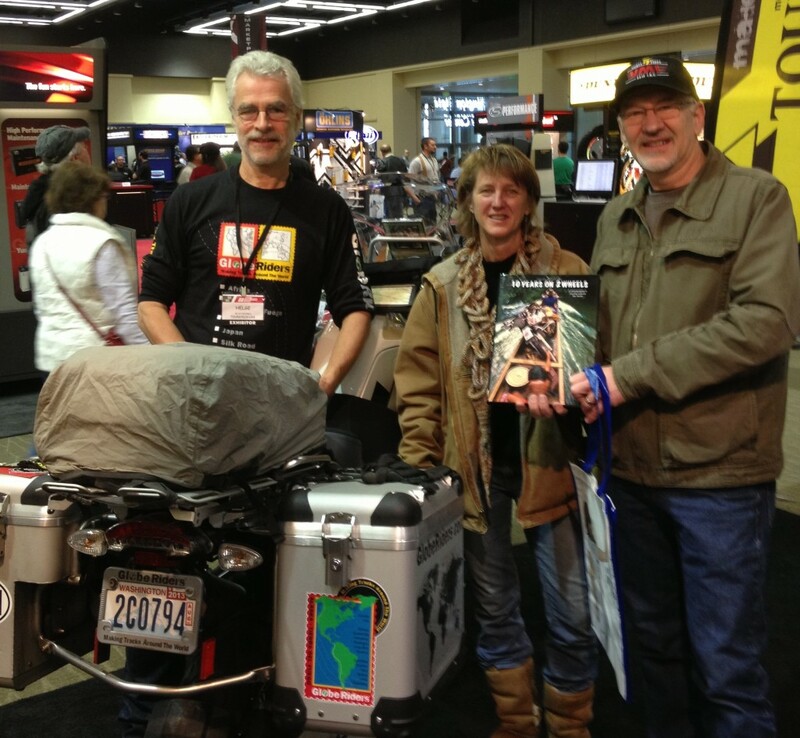 Our first stop at the show was the Touratech booth where we ran into our friend Tom Samulesen of Pacific Northwest Museum of Motorcycle fame visiting with Helge Pedersen. It’s always great to see Tom and hope to ride with him again soon. Funny, as I just went to the museum website to grab the link I saw my picture on the home page… ha. Here it is, I won this bike at the drawing two years ago. Helge is the author of the book Ten Years On Two Wheels and founder of GlobeRiders tours. Helge and I have many mutual friends and I was familiar with his travels but we had never met so it was fun to finally meet in person, I bought a copy of his book which he was gracious enough to autograph and pose for a picture. He’s friends with our riding partner Keith so he knew about our trip and took time to share some travel tips. Helge will be following a similar route as us with a group but will be a week or two ahead of us. We agreed to follow each other’s SPOT tracks and perhaps meet up somewhere. Next we stopped at the Sound Rider booth to catch up with Tom Mehren and Connie Adams. Tom and Connie organize the annual Sasquatch ride we’ve done for the past three years as well as Rally in the Gorge and many other events. Tom asked us to take a lot of pictures and hinted they might want us to do a slide show at the 2013 rally – wow. They wished us well on our journey and promised to follow the blog. I just went to Amazon and they are out of stock – yikes I hope I can get a couple more for the trip, I love how comfy they keep my feet and Deby loves how they really seem to control odor……. Ok, I’m going to get this posted and then spend some more time updating some of the tabs. If you haven’t already, be sure to check out the MotoRaid tab for the background of the trip. You two wonderful people have a safe and amazing trip to Buenos Aries – and back! You are the perfect ambassadors for our extended community to meet and greet those from all over the World. If you ever need direction – just look to the stars. Lots of love, Chris & Carol, Caitlin, Carson, Corey & John.